The first batch of data collected by the Hayabusa2 probe — in orbit around asteroid Ryugu — reveals the clues towards the object’s formation and early history as well as conditions in the early solar system. 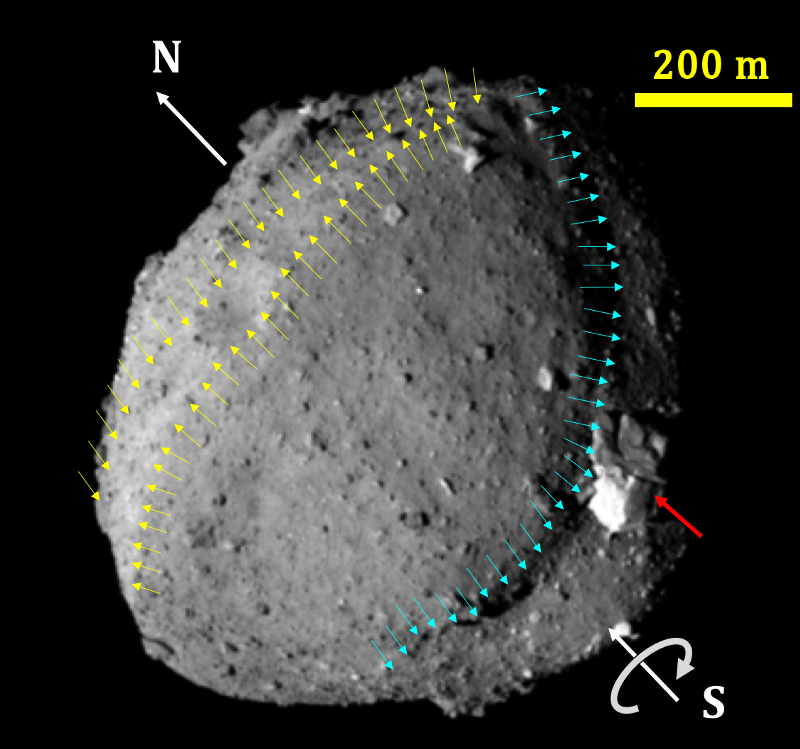 The Hayabusa2 space probe has gathered vast amounts of images and other data which gives researchers clues about Ryugu’s formation from a larger parent body. These details should, in turn, allow researchers to better estimate quantities and types of materials essential for life that were present as Earth formed. The Hayabusa2 probe launched on Wednesday, 3rd December 2014, atop an orange and white rocket over 50m tall weighing almost 300 tons from Tanegashima Space Center in South West Japan. Its carefully calculated trajectory swung Hayabusa2 round the Earth to pick up speed so it could reach its destination in the asteroid belt between Mars and Jupiter, arriving on schedule at its target — the asteroid Ryugu — on Wednesday 27th June 2018. Since then the spacecraft has used a wide range of cameras and instruments to collect images and data about Ryugu which it continually sends to researchers back on Earth. Hayabusa2 has even made a brief soft-landing on the asteroid and is being prepared for a second in which it will collect loose surface material — regolith — to return to Earth. Even though it will be another year before that sample returns, the team are far from idle in the meantime. Sugita describes the progress the probe has made thus far: “Just a few months after we received the first data we have already made some tantalising discoveries. Colleagues of Sugita state in a companion paper that various instruments on Hayabusa2 including a visible-light camera and a near-infrared spectrometer confirm this lack of water. This fact could be very significant, as it is currently believed that all of Earth’s water came from local asteroids, distant comets and the nebula or dust cloud that became our sun. The presence of dry asteroids in the asteroid belt would change models used to describe the chemical composition of the early solar system. But there’s more to this than water; other compounds crucial to life exist in asteroids and Ryugu has some surprises here too. To understand why it’s important to know that Hayabusa2 is not the only terrestrial robot out there exploring asteroids right now. In 2016 NASA launched OSIRIS-REx which arrived at its target asteroid Bennu on 3rd December 2018, four years to the day from the launch of Hayabusa2. The two projects are not in competition but actively share information and data which could help one another. Researchers compare their asteroids to learn even more than would be possible if they could only probe one. Although alike in most ways, Bennu and Ryugu differ significantly in some areas. They are both extremely dark, have spinning-top-like shapes and are covered in large boulders, but Ryugu contains far less water. This discrepancy has researchers scratching their heads. Sugita continues: “I hoped the surface of Ryugu had more variety as previous ground-based observations had suggested. 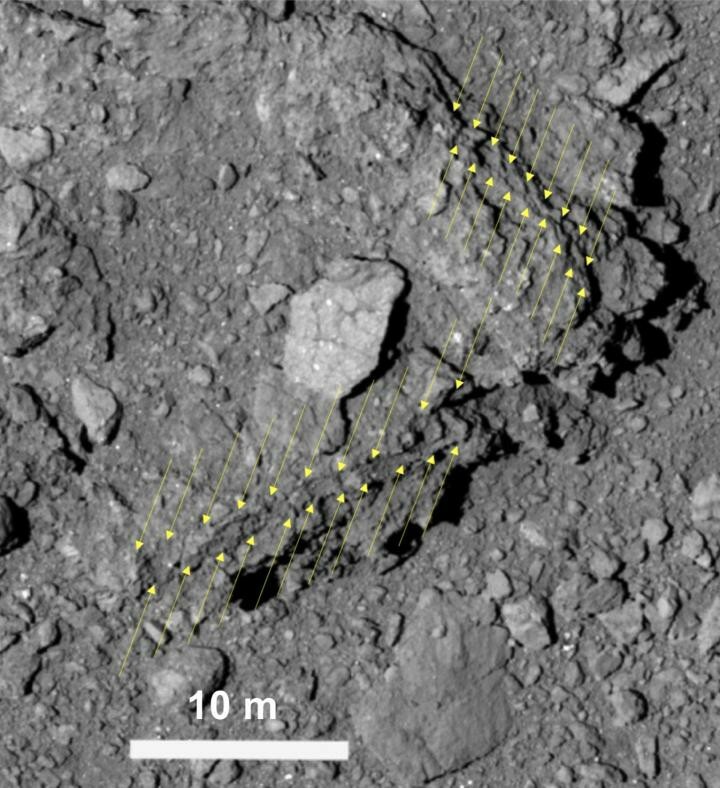 But every surface feature and boulder on Ryugu seems to be like every other, showing the same scarcity of water. As Hayabusa2 continues to explore our little rocky neighbour researchers gradually piece together its history, which is entwined with our own. 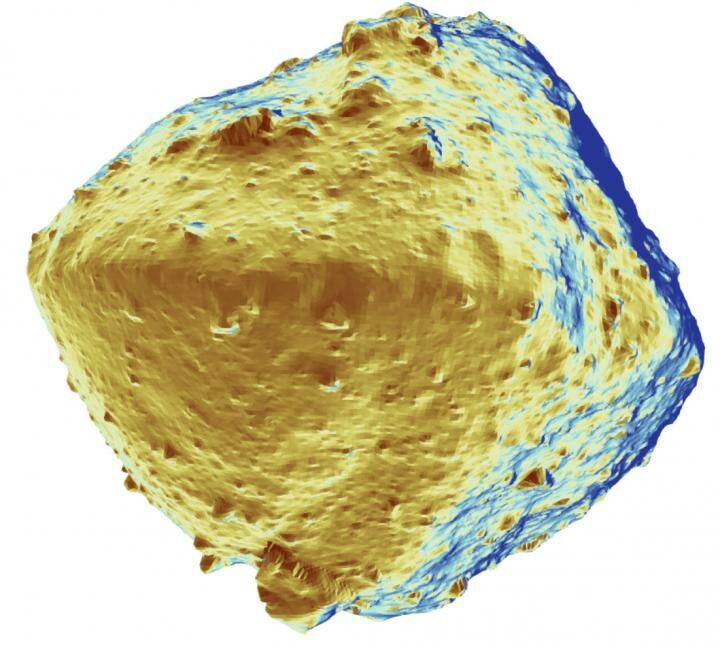 Sugita and his colleagues believe Ryugu comes from a parent asteroid several tens of kilometres wide, most likely in the asteroid families Polana or Eulalia. Sugita concludes: “Thanks to the parallel missions of Hayabusa2 and OSIRIS-REx, we can finally address the question of how these two asteroids came to be.